Swiss Chard (근대, gundae) is commonly eaten vegetable in the northeastern part of Korea. I don’t think I had this nutritious vegetable down in the south where I grew up. Swiss chard is easily obtainable in most parts of the world. And where I live, it is super cheap so I am so indulging Swiss chard in many dishes. I am not tired of them yet. 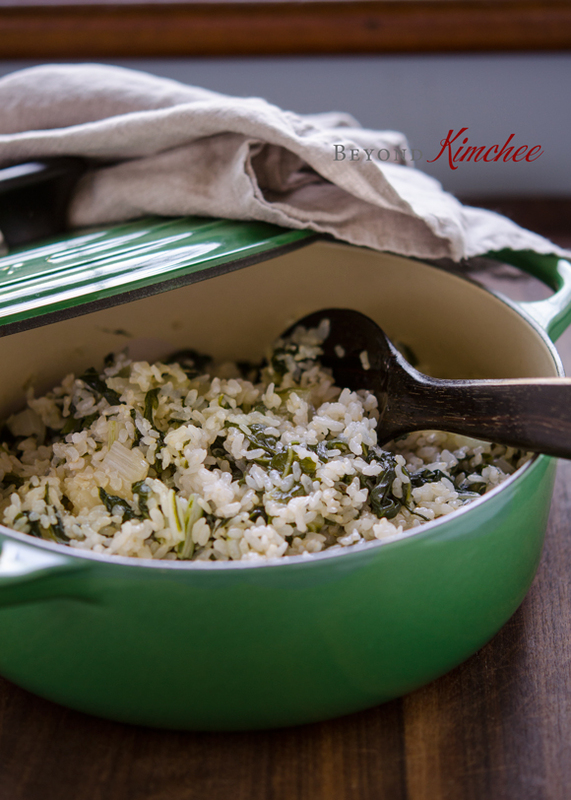 With almost creamy yet chewy texture of Korean brown rice cooked with Swiss chard, you can savor the healthiness at its best. It is super easy to make, of course! I hope you will get to try your Swiss chard in Korean way. Soak your brown rice in water overnight in the refrigerator. You will need to soak them so they can cook evenly and soft. You might wonder why my brown rice is not as yellow as most brown rice. It is because this particular brown rice called 5분도미(5 bundo-mi), is halfway between brown rice and white rice. It has removed 50% of bran layer during the milling process. It still has a great nutrition of the brown rice yet yield the soft and fresh taste of white rice. Check my All about Korean Rice post to find more information. Of course you don’t need to have this special rice to cook this. Plain white rice would be great, too. If using white rice, 30 minutes would be sufficient for soaking. For the brown rice, make sure you soak in the water long enough. It will also needs longer simmering time. 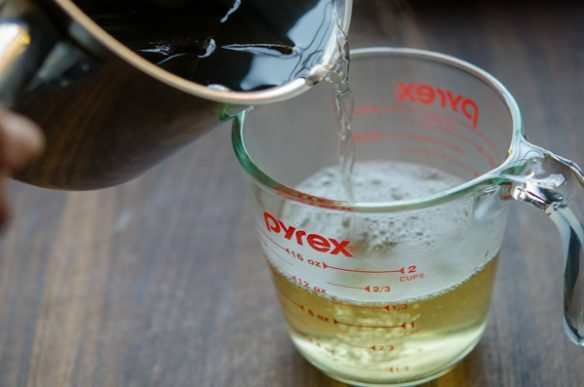 Make stock with dried sea kelp. Just boil 3 cups of water, add the sea kelp, and let it sit for 1o minutes. You will get the golden stock! 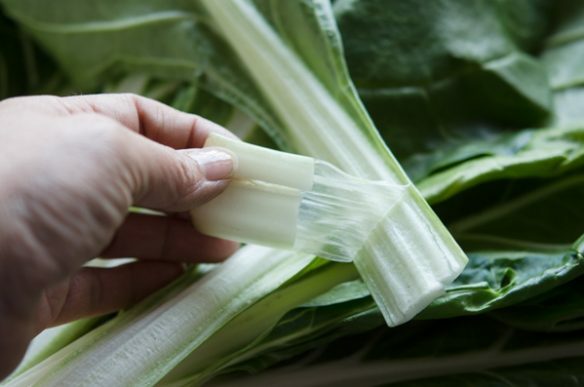 If your Swiss chard seems very thick and fibrous on the white part, bend the upper part of the stem toward the back and slowly peel off. It will remove some fibrous layer on the outside. 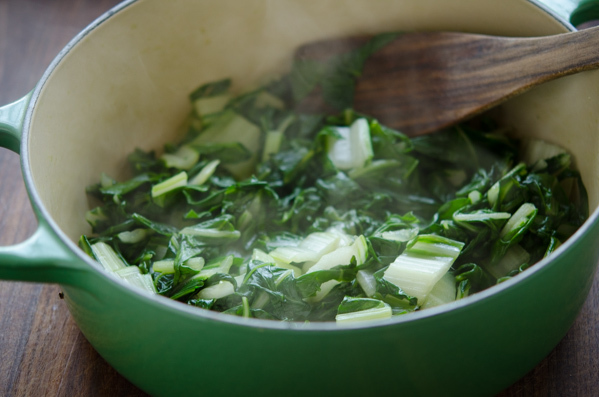 In a heavy bottom pot, heat wild sesame oil or sesame oil over medium heat and saute chopped Swiss chard until soft. Voila! they will reduce in half the volume very soon. Add rice and saute for 2 more minutes. Then add the stock. Boil, close the lid, and simmer for 15-20 minutes over low heat. Then remove from the heat and let it sit so the remaining heat in the pot do the rest. Need more detailed instructions on this part? Look at my post of How to cook rice on the stove. 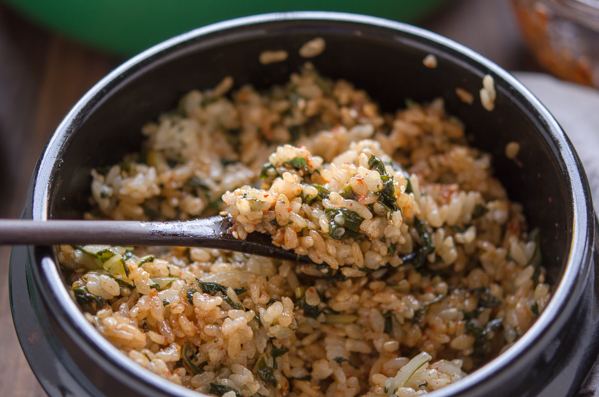 When the Swiss chard rice is done, fluff it with rice paddle (밥주걱 bap-jugeok) or spoon to incorporate everything. I like to eat a meat-free meal as least couple of times a week in my diet, just so that I don’t overfed myself with too much animal based protein. 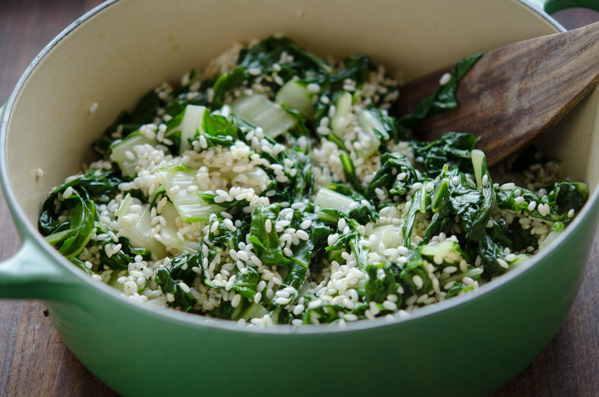 And this Swiss Chard and Brown Rice is the just perfect recipe for my needs. I hope you get to try it. Drain the rice from the water and set aside. To make stock, boil 3 cups of water and add the sea kelp. Remove from the heat and let it sit for 10 minutes for the flavor to release. Reserve 2 cups of stock. Ina heavy bottom pot, heat the sesame oil over medium heat, add the Swiss chard and saute until soft. Add the rice and continue to saute for 2 more minutes. Pour the reserved 2 cups of sea kelp stock into the pot. Let it boil, reduce the heat and simmer for 15-20 minutes, covered. Remove from heat and let it sit for another 5 minutes so the remaining heat inside the pot will finish the job. 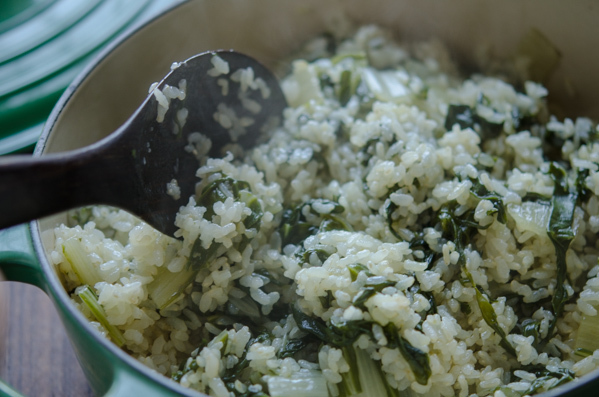 When done, fluff the rice so that they can be incorporated with Swiss chard. Meanwhile make the chili topping sauce by combining all the ingredients. To serve, spoon over the rice in a bowl, top with the sauce, and mix all together to incorporate the rice with the sauce. Serve warm and enjoy! Depends on the brown rice, you might need to increase the simmering time to achieve the soft texture. This looks so healthy and delicious! I'll be sure to pick up some swiss chard next time I'm at the store and try this out! Thanks Sarah. It is indeed delicious! Hope you get to try it. 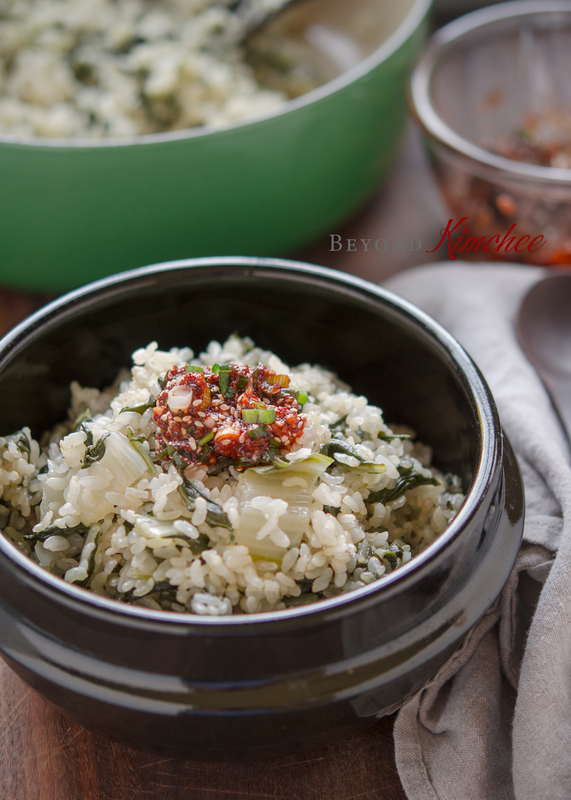 This looks fantastic as I love chard and these one pot rice dishes with yangnyumjang. I've never seen chard cooked like this before though. As a matter of fact, I didn't even know Koreans ate this vegetable until a few years ago when my mom made a delicious ssam lunch for me using chard leaves from her garden. Of course she only knew the korean name, and I had to look it up to see what it was. I will definitely try this soon! Reading this also makes me wonder if stir-frying soybean sprouts when making kongnamulbap gives more flavor. What do you think? 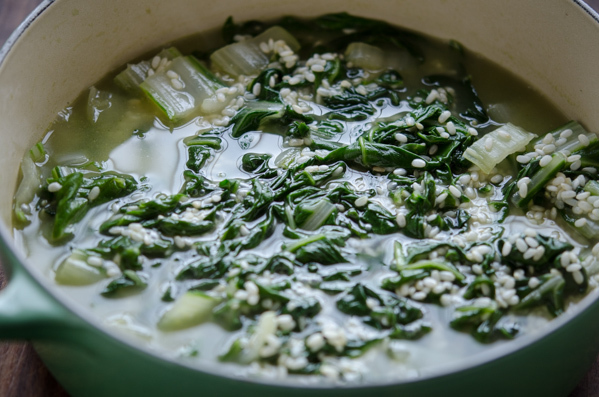 Hi AnMaikul Swiss chard is quite delicious vegetable and I use it quite often for soups, side salad, and into rice bowls like this. It tastes so good with the soy chili sauce. You don't need to stir-fry the soybean sprouts to make kongmamul-bap. It won't add much flavor. In fact, stir-frying will bring more raw flavor to the overall taste. Just steam together with rice and it will be delicious! We love Swiss chard, and grow it in our garden. So I'm always looking for new recipes! This looks outstanding -- thanks. You have a garden? That is so cool! This is an easy recipe and delicious. 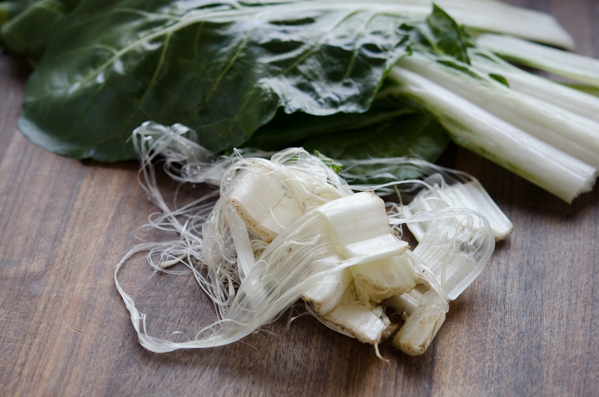 If you ever feel like Asian flavored Swiss chard, give it a shot! This sounds so good. I would probably serve it along with some tofu or other protein to balance the meal, but I love all the flavors. It's pretty too! Adding tofu is an excellent idea! Thanks for the tip! This looks so simple and delicious! 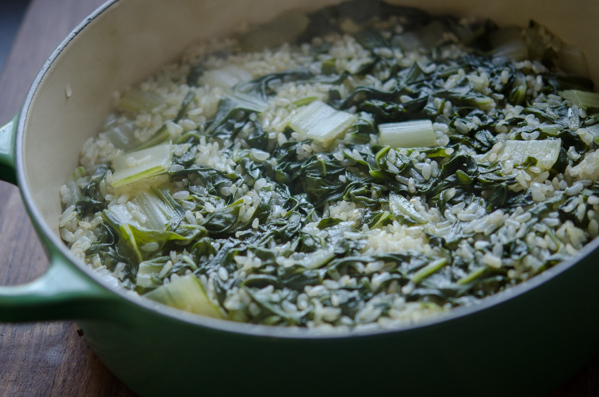 I think I will chop up the Swiss Chard just a little bit more to hide it in the rice so my little son will eat it. :D I can use up the Swiss Chard in my garden that just keeps growing and growing and growing. Thank you!! Good to hear that you can find the partially milled brown rice. Make sure you soak them in the water long enough so they cook evenly. I think Pak-choi is great to use in this recipe as well. Hope you like it. Dear Holly, Have just finished a steaming bowl of this. It's marvelous! It tastes so Korean, with earthy notes from the chard, with the classic Korean sauce stirred in. This is a real chard version since I sourced chard, rather than pak choi. I am going to have some tomorrow night rolled in lettuce leaves. Delicious. It's the first Korean food that I have eaten since my pregnancy started. 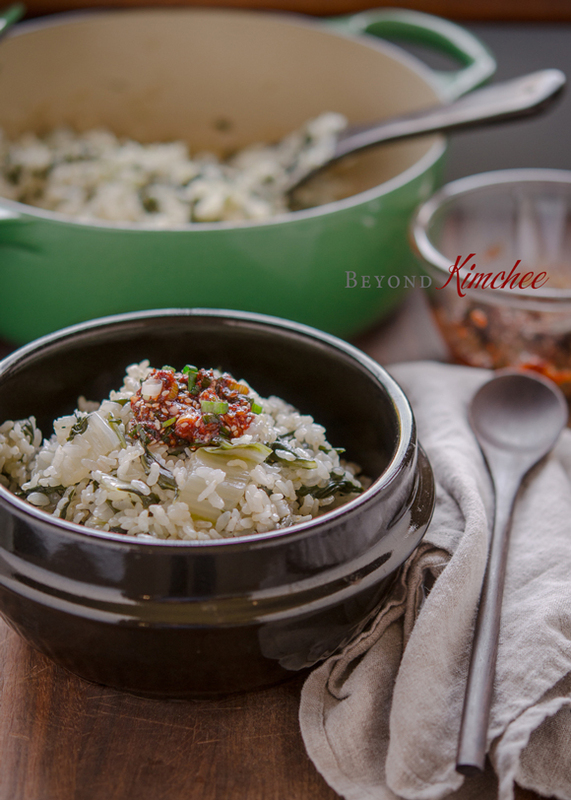 It's such a relief to enjoy the bold flavours of Korea again :) Being pregnant I simplified the recipe to bowl the sea vegetable and chard right along with the rice, to eliminate an extra step (and more dishes to wash). SO happy to hear that you liked it, Katharine. Hope everything goes well until the baby arrives. How exciting! 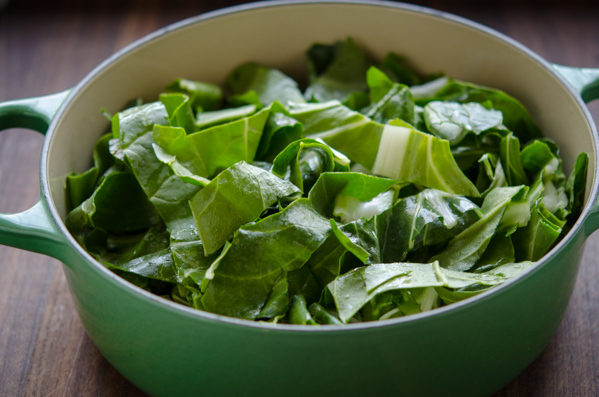 You are right, Swiss chard can go with many grains or starches. I better try with couscous someday soon. Thanks! Hi Alelxandra Yes, Korean food can be quite spicy for those who are not used to the spiciness. 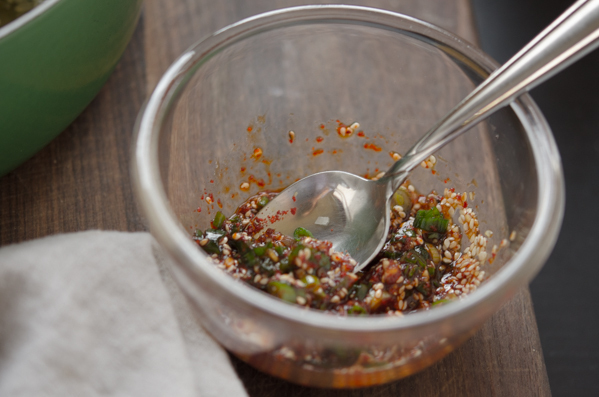 You can omit the chili flakes in the recipe and still enjoy the goodness of this dish. You can also top the dish with the some ground beef, pork, or even chicken to add protein as well. Just season the meat with some soy sauce, sesame oil, minced onion, a little bit of sugar to the meat and fry on the pan. Then top it on the rice with Swiss chard along with the topping sauce. Hope you enjoy this recipe. Thank you for stopping by! My husband loves this. He has requested that I make it every week. Some weeks we use kale and other weeks we use swiss chard. I use hondashi powder if I don't have time to make it with the kelp stock and it's still delicious. With some fried eggs on top, it makes a wonderful breakfast. Thanks for the amazing recipe! Glade that you liked it. Mixing white and brown rice makes very good taste rice. Stove top cooking of rice is easier than most people think. Thanks. Hi Your receipies are lovely and so clearly written. Some of course have lots ingredients which sometimes can be off putting but i think they are still better than many i have come across which made me give up making the dish even before i finished reading the "how to make it " line. I know that sesame oil or sesame seeds are main ingredients in Korean receipies but is there a way i can use it something else and make the dish still taste close to the original? My daughter has a very strong allergy to sesame. Thank you. 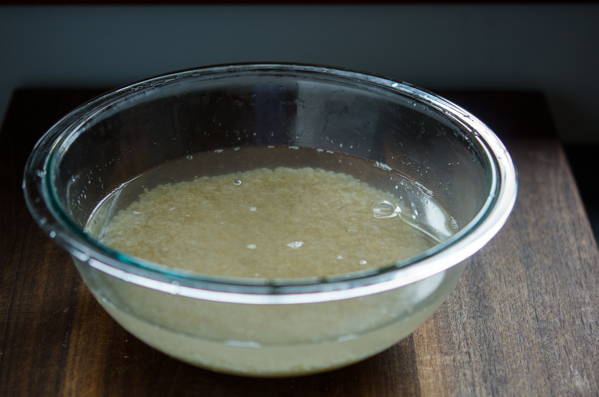 Unless sesame oil is the key ingredient in the recipe, you can omit it. It does bring the Asian (Korean) aroma to the dish, but won't change the flavor much. There isn't any right substitute for this fragrant sesame oil. You can still enjoy the delicious Korean dishes without it.